Big oil stocks are paying big dividends, but ExxonMobil, Royal Dutch Shell, and Chevron, are poorly positioned to reward investors long term. Energy stocks have long been viewed as offering some of the safest dividends on the market, particularly the big oil companies. Those petro-giants provide commodities that are essential for modern society, which means there's relatively little elasticity in demand, even when economic conditions go south. That fact, combined with more than a century of oil consumption growth, explains why the long-term returns for investors have been strong. But the energy business is changing rapidly, and disruption is coming to the oil and gas business faster than most observers had expected. Here's why ExxonMobil Corp. (NYSE:XOM), Royal Dutch Shell (NYSE:RDS-A)(NYSE:RDS-B), and Chevron Corp. (NYSE:CVX) are on the list of dividend stocks I'd never buy. Looking at oil consumption growth over the past decade, it would be easy to conclude that the oil business is doing well. Consumption is up and it's likely to grow slowly but surely in 2017 and 2018 as well. But electric vehicles are about to eat into oil demand. EV sales have grown from 320,713 worldwide in 2014 to 777,497 in 2016 and 893,370 through just the first 10 months of 2017, according to InsideEVs. And that impressive growth rate was achieved in a nascent market with relatively few EV options: General Motors (NYSE:GM), BMW, VW, and now Toyota (NYSE:TM) plan to launch dozens of new EV models by 2020. The researchers at consultancy Frost & Sullivan predict 2.8 million EVs will be sold in 2018, which would be 3% to 4% of all vehicles sold. That may seem like an insignificant fraction of the total, but remember that oil markets were oversupplied by only about 2% in 2014, and oil prices plunged more than 50%. A few percentage points of vehicles powered by electricity rather than by gasoline will be a big deal. The cost of owning an EV is also coming down, and is now cheaper than owning an internal-combustion-engine vehicle in some cases, a trend that will only get worse for oil companies in the future. It's hard to imagine a case where oil demand in 2025 is higher than it is today given the tailwinds the EV trend has pushing it forward. Even if oil is in trouble long term, one might assume that the fossil fuel majors might make up for some of that by selling more natural gas. After all, EVs need electricity, and natural gas power plants are the biggest supplier on the U.S. energy grid. The first problem with that theory is that natural gas isn't a one-to-one replacement for oil; it's far more efficient to burn natural gas in a power plant and send electrons to an EV than it is to burn oil in a small car engine. But the disruption here goes further than that. Renewable energy and energy storage are supplying an ever larger portion power to the grid, and while they're pushing out coal plants first, natural gas will likely be next. At Greentech Media's recent Energy Storage Summit, senior advisor Shayle Kann said, "I can't see a reason why we should ever build a gas peaker again in the U.S. after, say, 2025" because energy storage will be able to fill any "peak demand" gaps. Long term, natural gas will likely come under pressure from renewable energy in the same way that oil has come under pressure from EVs. With the big oil landscape laid out, it's worth looking at the dividends of ExxonMobil, Royal Dutch Shell, and Chevron, which currently yield 3.7%, 5.8%, and 3.6%, respectively. 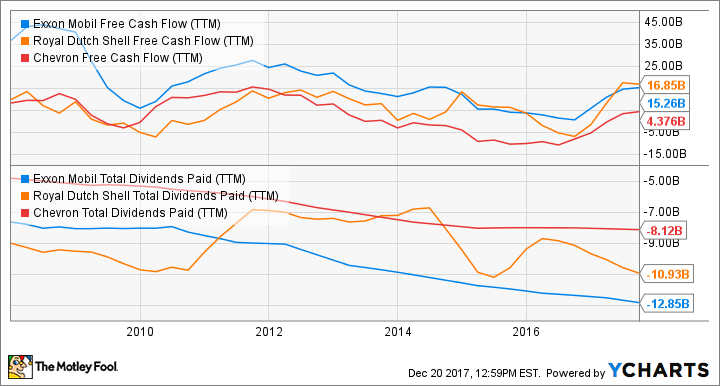 Right now, ExxonMobil's free cash flow isn't enough to cover its payout, and the only reason Royal Dutch Shell and Chevron have the free cash flow to fully cover theirs is that they've slashed capital expenditures over the past year. To fill their cash flow gaps, they've all added debt to their balance sheets. You can see below that all three companies have added tens of billions in debt over the past decade. 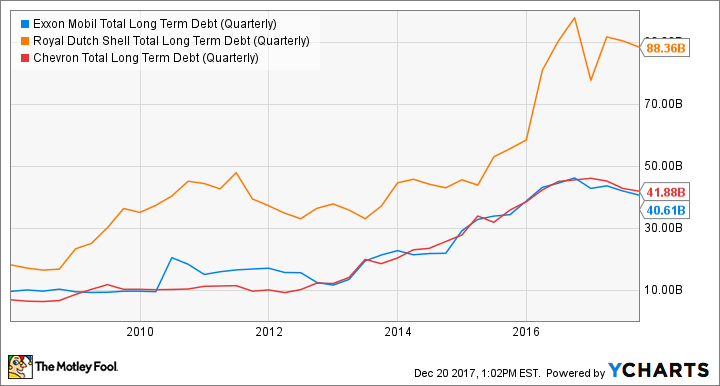 If their core oil and natural gas businesses come under pressure -- which is likely for the reasons detailed above -- those debt loads will force management to cut somewhere. 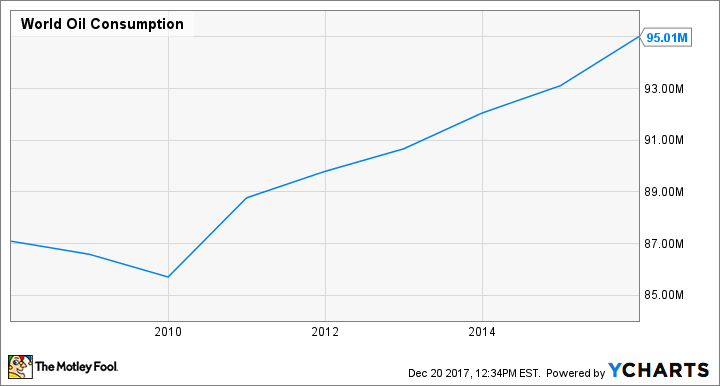 Capital expenditures have already been slashed to the bone because oil prices are low, so the next logical place to cut is the dividend. Dividend cuts at big oil companies may not come this year or next, but I think they're on the horizon. That's why I'm never buying these stocks, despite their high dividend yields today. I'm so confident I'll put my 94/100 CAPS rating on the line and make underperform calls on all three of these companies. Given the industry trends, I don't see a bright future for big oil stocks.